So the weather seems to have turned predictably chilly. No more running outside in just shirt sleeves. While full-on snowsuit weather is hopefully a day or two away yet, the seasons have turned so that I can reasonably enjoy hot cocoa without anyone giving me a weird sideways glance. Joe’s Cup O’Cocoa, available at Personal Service Coffee, hits the spot. This one does contain sucralose, although it is the last ingredient on the list. I only detected a slight after taste, something I easily covered up with marshmallows. Good thing these Kcups are only 60 calories apiece. It brews best at the 8 oz setting – just the right size to feed the kids when they tumble off the bus after a long day. 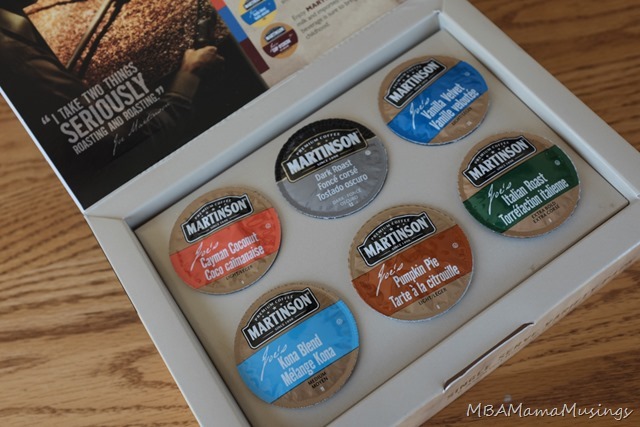 Personal Service also carries an extensive line of Martinson’s coffees. I am pretty impressed with the different coffee varieties. The Italian Roast has a just slightly bitter edge to it, but not so much that it is unpleasant. It is reminiscent of a French press cup. The Kona Blend is much smoother – more of a morning beverage. The Dark Roast stands up well to my cream and sugar additions and provides a good jolt to break me out of my 3 pm slump. Despite not being a huge fan of their flavoured coffees overall, I did find myself really like the Vanilla Velvet. It had just enough of a vanilla aroma to it that I could both smell and taste it in the final brew. The Cayman Coconut flavour was sent out for neighbourhood peer review. The results came back that it was indeed plenty coconut-y, but not like sniffing sunscreen. The aroma reminded my taste tester of baking with coconut. Pumpkin Pie is only available for a limited time, so make sure you stock up while you can. 2 Responses to "Weather’s Turned Chilly? 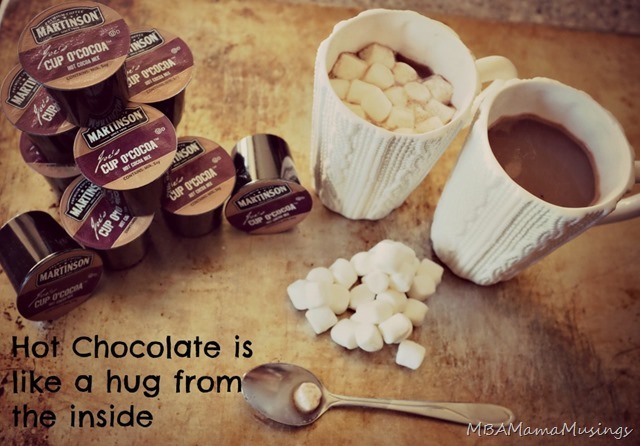 Break Out The Hot Cocoa #quote"
The Cayman Coconut is really good! I always know I can count on my readers - thanks!